We highly encourage you to take advantage of one of these Pre-registration and number pick up opportunities. Avoid the lines on race day!!! Friday October 26, 2018 at Marathon Sports Yarmouth (484 Station Ave South Yarmouth) from 4:00 pm to 6:00 pm. Everything in the store will be 20% off (excluding electronics). Saturday October 27, 2018 at Dennis Police Department (90 Bob Crowell Road South Dennis) from noon until 4 pm. Avoid race day rush... pick up your numbers and purchase your race day technical T-Shirts! Race starts and finishes at the stunning Mayflower Beach. Race participants will be able to enjoy the off-season beauty of Dennis northside and a private after-party within walking distance at Chapin's Restaurant. Race participants are encouraged to wear Halloween themed costumes. A costume parade and contest will be held at Chapin's at 12:30 PM. NEW THIS YEAR!!! 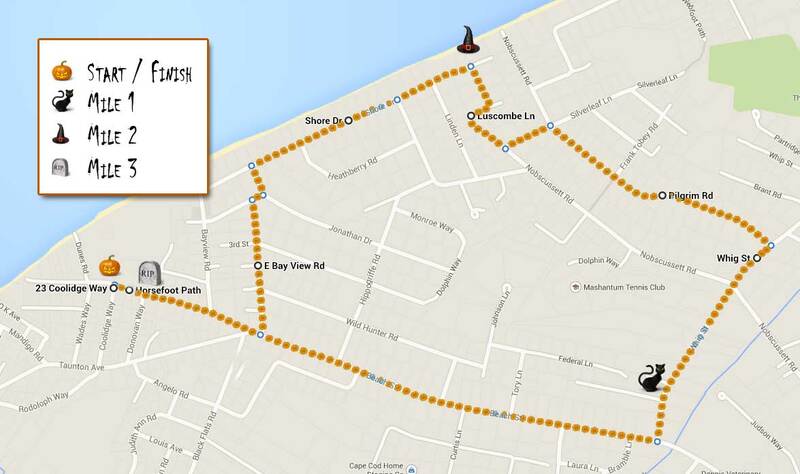 Due to construction at Mayflower Beach there will be NO onsite parking available at the starting line. ALL parking with shuttle service to the start is available at Cape Cinema, 35 Hope Lane, Dennis. Shuttles will start from Cape Cinema at 9:00 am and operate until 10:30 am. Shuttles will drop runners at the intersection of Bayview Road and Horsefoot Path, a short walk to the starting line. Once the last shuttle leaves for the start at 10:30 am, access to the start will only be available on foot. Cape Cinema is approximately 1.5 miles from the starting line. RETURNING TO YOUR CAR AFTER THE RACE: After the race shuttles will be leaving from Taunton Ave/Wades Way and shuttling back to the Cinema beginning at 11:45 am and operating until 2 pm. THERE IS NO ONSITE PARKING!!!! In consideration of acceptance of my entry the undersigned hereby, for myself, my heirs, successors, assigns, executors, and administrators hereby waive and release all claims for damages for injuries or any other loss which may arise or result from my participation in the Dennis Police 5K: Halloween Hustle (the Event) against the following entities and parties: The Dennis Police Association, Town of Dennis,Event sponsors, Event charitable beneficiaries, Event volunteers, including with respect to each of the foregoing their representatives, successors, agents, employees, servants, directors, and officers (collectively the Released Parties) including such injuries caused by the negligence, gross negligence, or other fault of the Released Parties or any one of them. I understand that participation in road race events is an inherently dangerous activity with a risk of serious injury or death. I represent that I am physically fit and sufficiently trained to safely participate in and complete this Event as a foot race entrant, and that a licensed physician has verified my fitness for this Event. I hereby authorize the Released Parties to use my likeness in photographs, motion pictures, video, or digital recordings, or any other form of video or audio recording for the purpose of reporting or promoting this or similar events.